Will dish soap harm my health? The hypothesis is that washing dishes manually leaves some harmful detergent residue which we consume the next time the dishes are used for eating or drinking. Are the residues from common manual dishwashing significantly toxic to humans in the short or long term? Rob - Washing up liquids generally contain a mixture of chemicals such as detergents, fragrances, colourings, glycols, and alcohols. Indeed, if you look on the internet, you can quickly confirm that many of these ingredients are categorised as hazardous or irritant. However, the hazard classification of each chemical is based on the toxicity of the pure material, it does not take into account the effects of dilution. Katie - So to break that down, it’s not about technically how toxic the pure chemical is, it’s about how much of it you might ingest. Rob - The actual toxicity of a substance is dependent on the dose, and this is something that was first observed by a Swiss physician called Paracelsus in the 16th century. Now, as a great example, everybody knows that cyanide is highly toxic and, of course, Agatha Christie used this to great effect in her novels. But, every person on Earth is exposed on a daily basis to cyanide through the food we eat, the water we drink, and sometimes the air that we breathe but, of course, the human race lives on. The reason for this is because the dose of cyanide we’re exposed to is actually too low to have any measurable effect. Katie - Well, that’s a relief. So how low is the dose of washing up liquid that we might be dealing with? Rob - The main ingredient of most washing up products is water and so the chemicals that are present in the washing up liquids are already diluted. Adding a few drops of washing up liquid to a few litres of water in a bowl or a sink produces a very large additional dilution. The remaining dose of chemicals is further reduced when the washed item is removed from the washing up bowl and allowed to drain. If the items are rinsed in fresh water before draining, then the vast majority of the chemicals originally present in the washing up liquid would be removed. The semi-opaque residue that can sometimes be seen on plates and cutlery after washing is not necessarily washing up liquid, but actually the residue of a thin layer of grease from food. 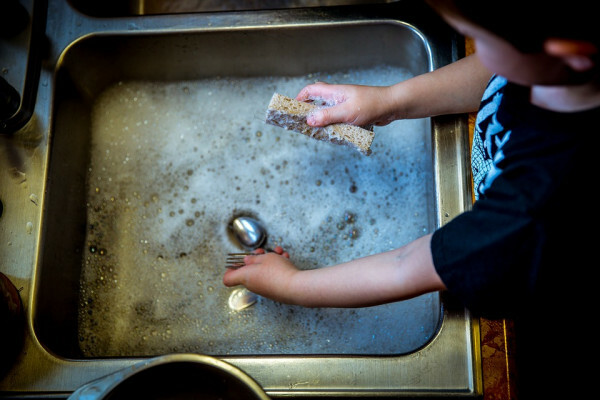 Katie - Overall, it’s not that likely that dishwashing residue is going to be hazardous to our health and washing your dishes, rather than just leaving them on the side should minimize the risk of food poisoning. Previous How much green skin would we need to photosynthesise? Next Could machines take over the world? Why does soap stop mirrors from fogging? Why is old soap useless? QotW: Why won't old soap make suds?